Dutch design duo Maarten Heijltjes and Simon Akkaya of Waarmakers designed the Be.e scooter for sustainable mobility brand Van.Eko, using natural fibre-reinforced composites (NFCs) instead of traditional steel and plastics. The bio-composite monocoque body is made of hemp, flax and bio-resins and mimics that of an egg shell. "The monocoque structure means there is no internal frame," Akkaya told Dezeen. "The smooth outside surface is what gives the scooter its strength." "The design of the Be.e proves that supporting structures in high-impact transportation vehicles, more commonly made with steel, can be replaced with more sustainable natural fibres, without losing strength or performance," said Akkaya. Unveiled on 27 June, the Be.e scooter was designed in collaboration with Inholland University of Applied Sciences and NPSP composites. Amsterdam-based Waarmakers specialise in sustainable design. Past projects include the Goedzak refuse sacks, designed for discarding unwanted items for others to collect. We designed the greenest scooter ever; this e-scooter is made from plants, seriously. The Be.e is a frameless bio-composite electric scooter, with a monocoque body made from flax and bio-resin. In a collaborative effort with InHolland, NPSP composites and Van.Eko, Waarmakers designed the Be.e; the first bio-based e-scooter. The Be.e has a monocoque body; a unique construction in which the object’s external skin supports the load, similar to an eggshell, eliminating the need for a frame and the usual numerous plastic panels. This structural engineering feat is made from Dutch flax and bio-resin, extremely sustainable, lightweight and strong. 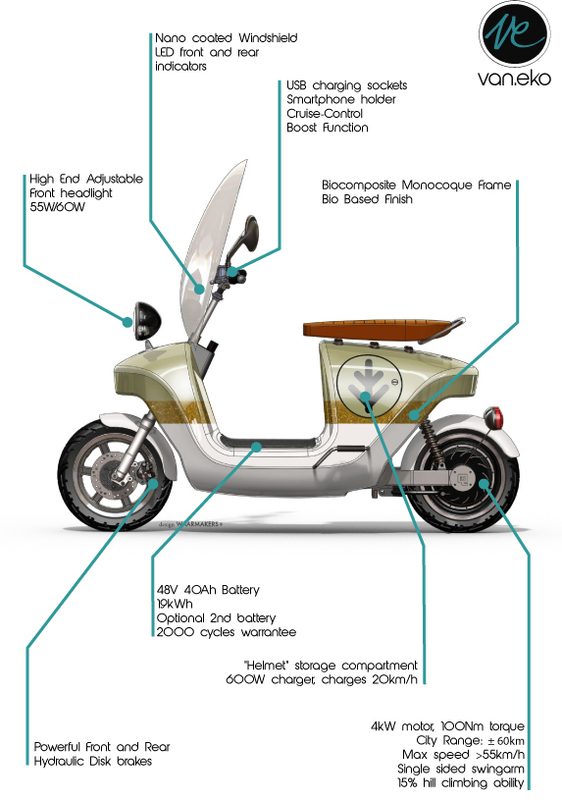 We were responsible for the overall design of the scooter, it’s monocoque and detailed parts. A task which challenged not only our engineering skills, but also our abilities to design a shape, an image, which communicates it’s unique configuration in an elegant but distinct way.